Control panel for Truma S3002 fires. Black with a hint of brown. Includes blanking plugs for unwanted holes. Suitable for left or right handed units. Just what we needed and was easy to fit. Quick delivery. We managed to break the top cover of our Truma S3002 Fire when an item fell from the over cab bed in our motorhome. I thought the top cover for the heater would be difficult to acquire and was delighted to find the exact colour with all the blanking plugs supplied at leisureshopdirect.com. The top cover was quite easy to fit requiring only two screw drivers. Top Cover For Truma S3002 Fire. Excellent product. Arrived a couple of days earlier than expected. Easy to fit - just remove front cover, turn upside down, locate the two fixing screws and job done. Looks good in the van but why oh why it merits a 50 quid price tag I'll never know. But that's caravanning and the leisure market generally. If you can afford a caravan/motor home you're fair game to be ripped off for spares! Good service from this company, though. Good service and Good product, with the bonus that previous customer reviews told me how to tackle the job, thanks very much. Having loaned our caravan to friends, it was returned with the heater top accidentally broken. Found the only replacement at reasonable price with Leisureshopdirect, who delivered on time, and fitted it same day in less than 30 mins with the help of previous customer reviews, - a real bonus. Needed to replace a cracked cover and this was perfect for the Truma S3002 Fire. Truma Caravan Heater - Top Cover. The top cover of our Truma caravan heater got broken, I thought i might have to buy a complete new cover ! However Leisure Shop Direct had just the top cover, this was ordered and delivered within a week. Excellent service, if I ever need any other caravan accessories I know where i will be looking first. Nice speedy delivery. The Truma S3002 top cover was perfect to replace the old broken one. Easy to fit. The new control panel (top to trauma fire) was exactly what I needed and was delivered quickly and purchased at a reasonable cost. What a comprehensive catalogue from Leisure shop - everything you need. It's a pity that Truma don't realise that this top panel is rather flimsy and is liable to break under fairly light pressure. Why don't they make it more durable in the first place? We had a problem working out which model we had, but thanks to these guy's not only did we get the right one but also was delivered on time. Purchased new Truma Fire Top Cover to replace broken one. Found website easy to use, item was at a good price, order process went smoothly. Item was delivered within estimated delivery period. A very good experience. as described , posted quick , will shop again with this company. The product supplied(top cover for Truma S3002 fire) was exactly as described and fitted perfectly.I will continue to shop with your company as the 2 products I have purchased (top cover as mentioned and manual pump for toilet) have been excellent and at a very competitive price.Well done! great item for my heater and a really good price , will use leisureshop again. Easy to order (great website), fast post, easy to fit. The perfect combination! Thank you, I'll be back. Exact part for fire as ordered no problem. Great, easy to fit. As It Said On The Website !! Very quick delivery and amazingly good value for money, a rare thing these days. Well worth the money as it now looks brand new again. I wonder why i put up with the broken one for over a year. excellent service, was delivered the very next day. Original top became marked on brand new Coachman on first outing! Not sure how, but a spill type mark. Relieved to find replacement at a reasonable price. Fitting was easy, but beware of locating "prongs" on top of front cover. Easy to mark new top if not positioned correctly! Also as previous reviewer mentioned, pre-cut the threads before assembly, makes it much easier. When my '03 Truma S3002 gas heater top cracked, I steeled myself for an expensive replacement. Ebay yielded £39 + P&P and so I wasn't hopeful when widening my search. I was pleasantly surprised to find one available here for £20 delivered! Even more amazed at the quality and speed of the service provided by Leisureshop too, I received emails to acknowledge my order, let me know when it has shipped and sure enough, I had it next day! As for fitting, I'd second 'Alan''s advice below - cut the thread in the mounting points with the screws first. Then assemble it, you'll cut your knuckles to ribbons otherwise! Also, the replacement item seems to be of a different plastic to the original and a lot less brittle as a result. exactly as described and the delivery was first class,i will certainly return in future if more products are required.Also the price was excellent no one could match nit. Just what I needed The cover arrived and fitted perfectly it also came with switch blanks too. Just what you want, next day delivery, excellent product and easy fitting, Thanks! I needed to replace the top cover of my heater after a friend had leant on it and cracked the rather brittle plastic. 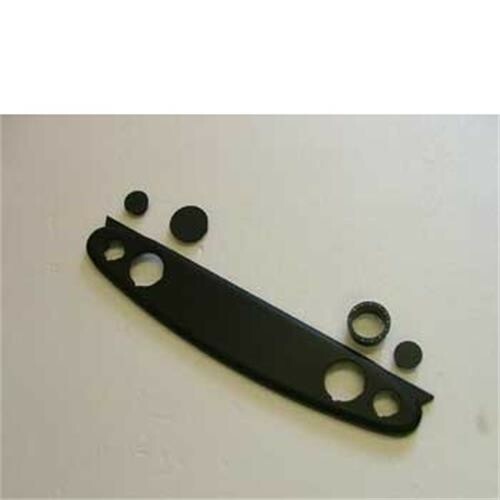 Knowing that replacement parts for motorhome accessories can be very expensive, I was pleased to find The Truma Heater Top Cover listed by Leisure Shop Direct for under £20. The item was delivered within 24 hours of placing my order which is excellent service. Although there were no instructions fitting was straightforward involving only 2 screws. Overall very satisfied with a great service. It was exactly as described and delivered in super fast time. Pleased with the service and price. Anyone fitting one NOTE, cut the threads using the screws supplied FIRST then assemble. great service , product easy to fit. Thankyou. Product a bit brittle, hence ex broken.